Businesses are built on data, and applications that access that data. In modern businesses the same cloud-based data stores and applications might be accessed by hundreds of different applications from thousands of different devices via APIs. To make this happen, APIs must be wired together i.e. integrated. Oracle Integration Cloud Service provides a complete method for integrating enterprise applications in the cloud. Integration Cloud Service (ICS) provides a cloud hosted means to integrate systems together using a graphical means to define and represent integrations. This book will be a comprehensive, hands-on guide to building successful, high-availability integrations on ICS. 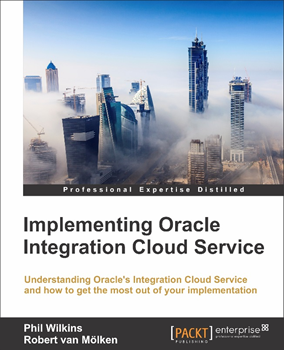 This book sets out to demonstrate how ICS can be used to effectively implement integrations that work both in the cloud and on premise. It starts with a fast, practical introduction to what ICS can do for your business and then shows how ICS allows you to develop integrations not only quickly but in a way that means they are maintainable and extensible. Gradually it moves into more advanced integrations, showing how to achieve sophisticated results with ICS and work with external applications. Finally the book shows you how to monitor cloud apps and go beyond ICS to build even more powerful integrated applications. By the end of the book, you will the knowledge on how to use ICS to solve your own integration needs and harness the technologies in a maintainable and sustainable manner. The book is available through Packt Publishing here. For additional SOA books please visit the wiki here.